A great way combination of flavours and nourishment, Red Lentil Soup is quick and easy to make. This soup is spicy, vegan and can be customised according to your taste preference. 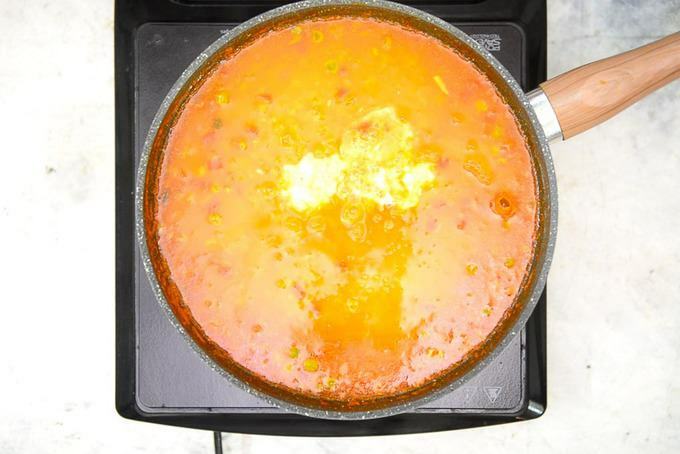 Here is how to make Red Lentil Soup Recipe at home. At the end of the day, there is nothing like sipping some piping hot soup to get rid of all the stress and feel rejuvenated. That’s the reason why I make sure to prepare soup frequently for dinner. Firstly, soups are really nutritious and they tend to be light on the stomach. Thai Pumpkin Noodle Soup is my son’s favourite and on the other hand, my husband simply loves to relish a piping hot bowl of Tomato Basil Soup. As much as I love relishing soups, I love brainstorming new recipes and using unique ingredients even more! Red Lentil Soup with Coconut Milk is one such recipe that I thought would certainly surprise taste buds. Oh, and it surely did! 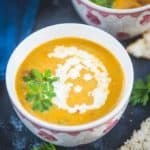 I have used Masoor ki Dal or Red Lentil, olive oil and different veggies such as carrots, peas, Jalapeno peppers, tomato puree et al to blend along with creamy coconut milk to make Red lentil Coconut Soup. In order to make this more palatable, you may also add some pumpkin, roasted red pepper, chicken broth, carrot, celery etc to it. To keep it simple, trust me, even onion and garlic with lemon works just fine. This rich concoction tastes super delicious after it gets boiled along with all the other spices such as turmeric powder, red chilli powder et al. Additionally, you may even add cayenne pepper, bay leaf, lemon juice so that with heat, this soup catches a very good edgy flavour. – As good as eating spinach, barley, chicken, squash and even quinoa, lentils are some of the best sources for folate as well as manganese. – Furthermore, lentils also contain protein. – Lentils are also good for our heart, digestion because they contain folic acid, fiber. – Most importantly, lentils have selenium which combats cancer. – Lastly, lentils contain iron which keeps you going every day. Red Lentil Soup with Coconut Milk accounts as a slow cooker promising meal. You may also make it in your Instant Pot if you wish. 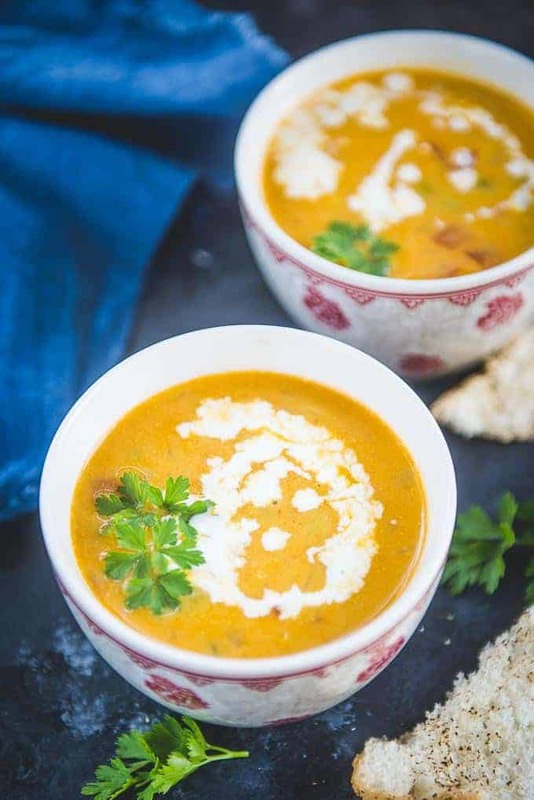 Boil a large pot of delicious Red Lentil Soup with Coconut Milk for a warm family dinner and see how you all instantly bond more over this flavourful soup. Bon Appetite! In Slow Cooker – To make red lentil soup in slow cooker, dump all the ingredients except lemon juice and coconut milk in the pot of your slow cooker. Cover the pot and cook the soup on low for 6-8 hours. Add lemon juice and coconut milk and cook for another 30 minutes. 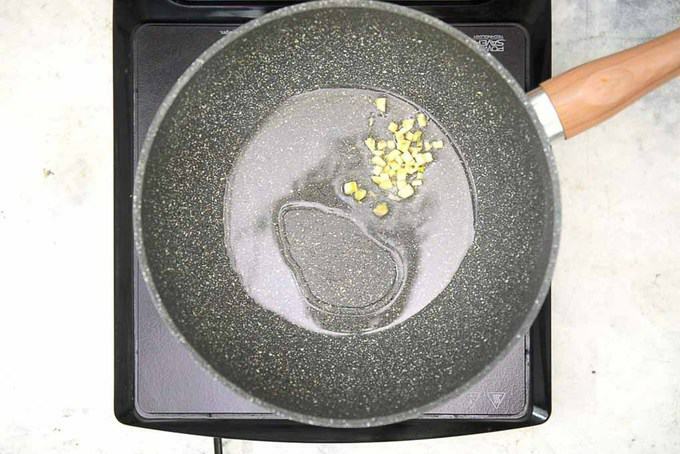 In Instant pot – Press the SAUTE button and add olive oil. Add garlic and saute for 2 minutes. 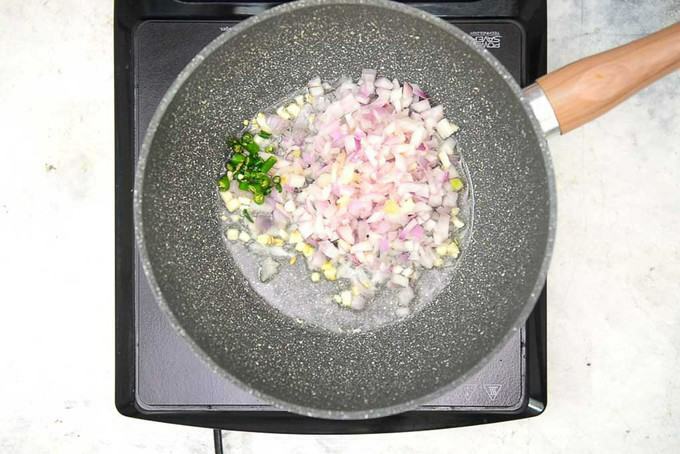 Add onion and Jalapeno and saute for another 2 minutes. Now add the remaining ingredients except lemon juice and coconut milk and close the lid. Press PRESSURE COOK and set the timer to 10 minutes. 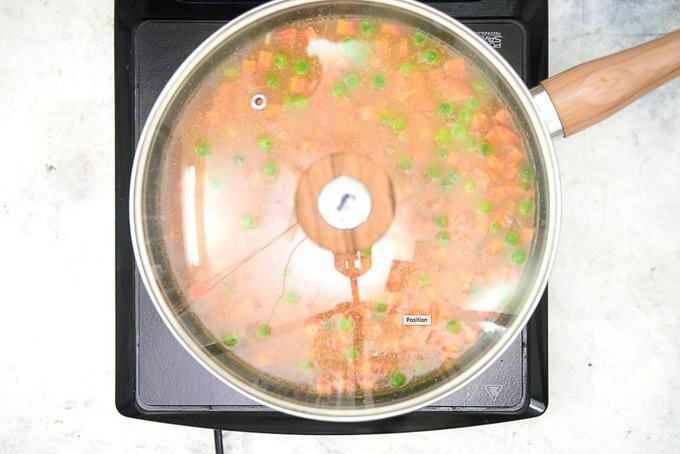 Once the timer goes off, let the pressure release for 15 minutes and then open the lid. Add lemon juice and coconut milk and mix well. You can add ingredients like spinach, barley, chicken, squash, quinoa, pumpkin, roasted red pepper, tomato etc to this soup recipe to give it a variation. 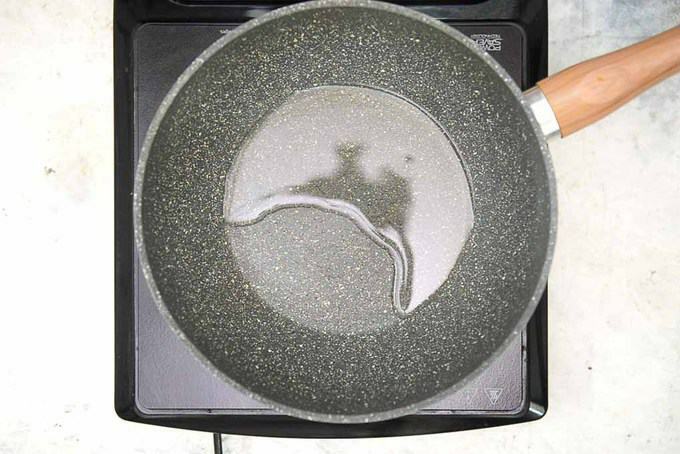 Heat olive oil in a large heavy bottom pan. Add garlic and fry till light brown in color. Add onions and pepper and fry for a minute. 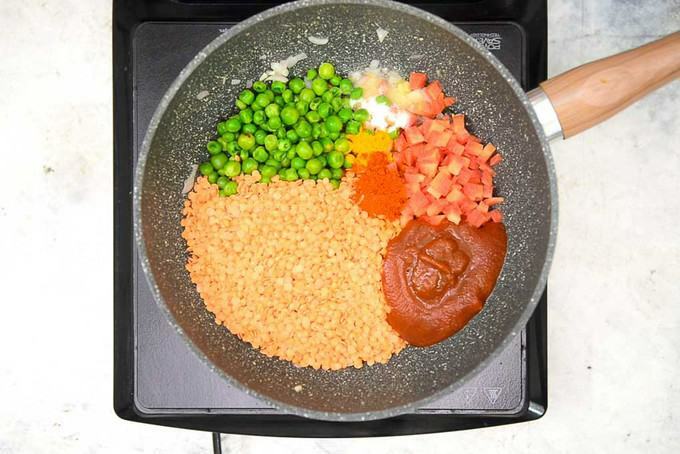 Now add carrots, peas, lentils, tomato puree, salt, red chilli powder and turmeric powder. Next. add 6 cups of water and cover and cook till lentils are soft and tender. Lastly, add coconut milk and lemon juice. 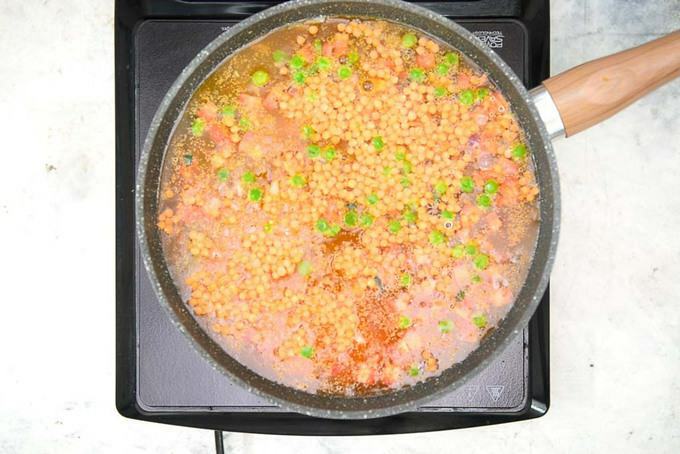 A great way combination of flavours and nourishment, Red Lentil Soup is quick and easy to make. This soup is spicy, vegan and can be customised according to your taste preference. Serve hot with some bread.